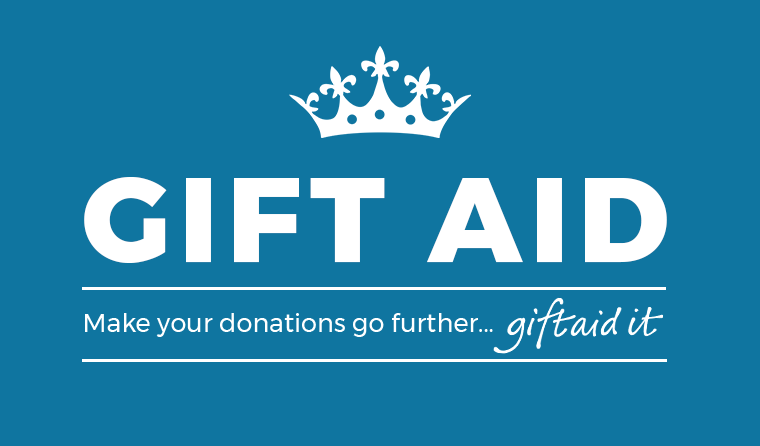 Gift Aid is a program the UK government put in place to encourage donors to give more via a tax relief incentive. Under the program, UK income taxpayers complete a declaration that they are a UK taxpayer. Any donations that the taxpayer makes to a charity are then treated as being made after deduction of income tax at the basic rate of 20%. The charity can then reclaim the basic rate income tax paid on the gift from HMRC. For a basic-rate taxpayer, this adds approximately 25% to the value of any gift made under this program. We’ve built the add-on to be an all-inclusive package that has everything you need in order for you to begin allowing accepting Gift Aid through your Give-powered online donation forms. 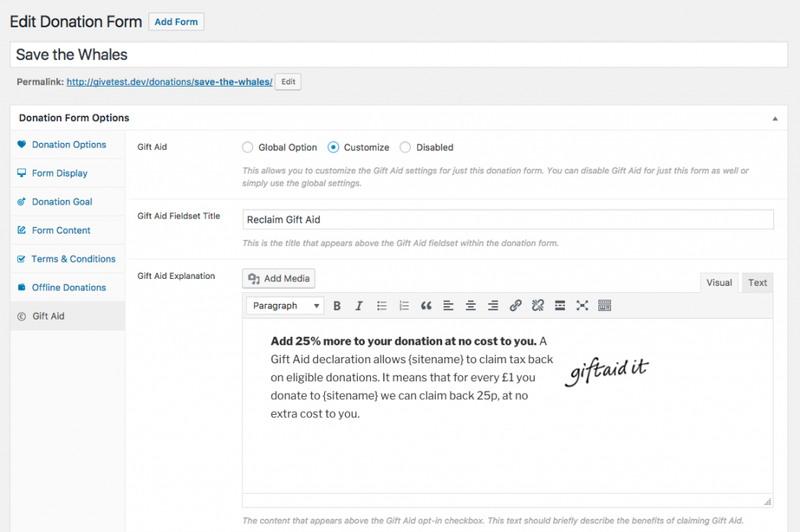 Upon activation, the plugin includes default settings with meticulously written content that will provide your donors with a clear understanding of what Gift Aid is and why they should opt-in to give with it. It doesn’t stop there. There are many other features included to get you up and running accepting Gift Aid quickly and easily. 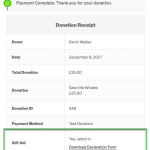 We go above and beyond just adding a simple checkbox to your donation forms. 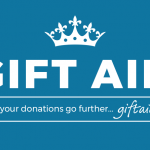 From the get-go, the objective of the Gift Aid add-on is to provide donors with a clear understanding of what Gift Aid is and why they should opt-in with their donation. 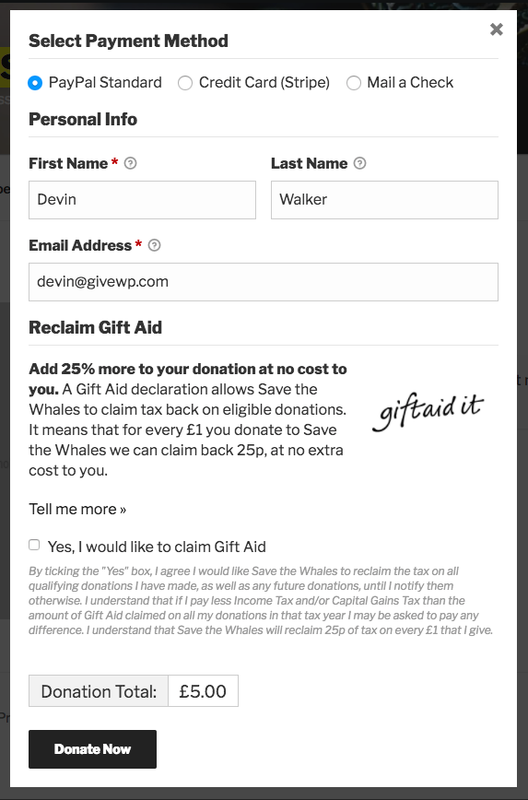 The Gift Aid fieldset within a donation form. 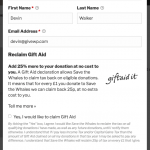 The “Tell Me More” link leads to an optional in depth Gift Aid explanation. All the content you see is customizable to suit your specific fundraising needs. 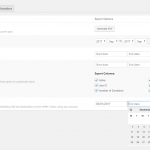 Additionally, many options, including the extended explanation option, can be enabled or disabled on a per form basis. Rule #1 – Don’t frustrate your users when they’re completing their donations. If a donor has already entered in an address within the billing field’s then the add-on will simply ask them if they would like to use the same address rather than having them re-enter the information. This improves the overall donor experience and lessens the number of fields they have to complete to make their donation. 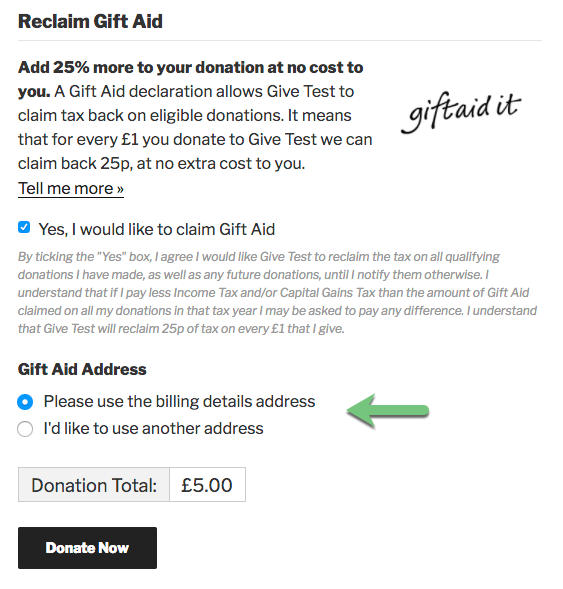 Gift Aid’s intelligent address detection feature. The Gift Aid fieldset will not display in donation forms for visitors who select a country other than the UK. 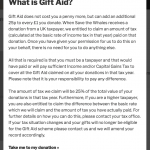 Because Gift Aid is only a UK program valid for tax paying citizens of that country it would be unnecessary and burdensome to ask non-UK donors to participate. The Gift Aid fieldset appears conditionally based on the chosen country. 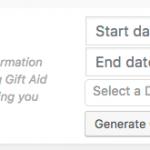 The Gift Aid add-on offers flexibility to be enabled and customized for all your donation forms or for just a few select forms. With the “Global” and “Per Form” customizations built in you have the power to do just that. The per form customization features of Gift Aid. Each option includes default settings and content to help you get started faster. This saves you time figuring out the plugin and gives you a head start on making this feature as clear as possible for your donors. Filing taxes can be hard! We’ve worked hard to reduce some of the burdens with excellent reporting and export features. 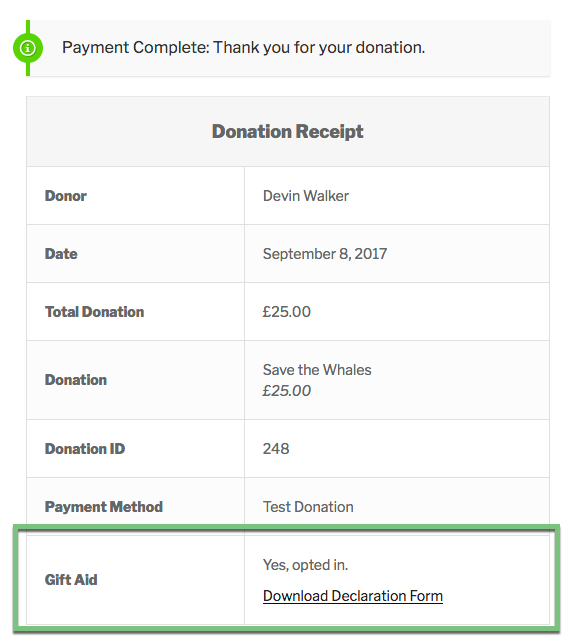 With this add-on, you can export in bulk Gift Aid donations to CSV files and also download PDF declaration forms for printing and filing purposes. 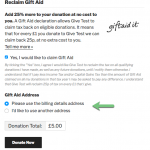 Gift Aid offers single or bulk download and export options. 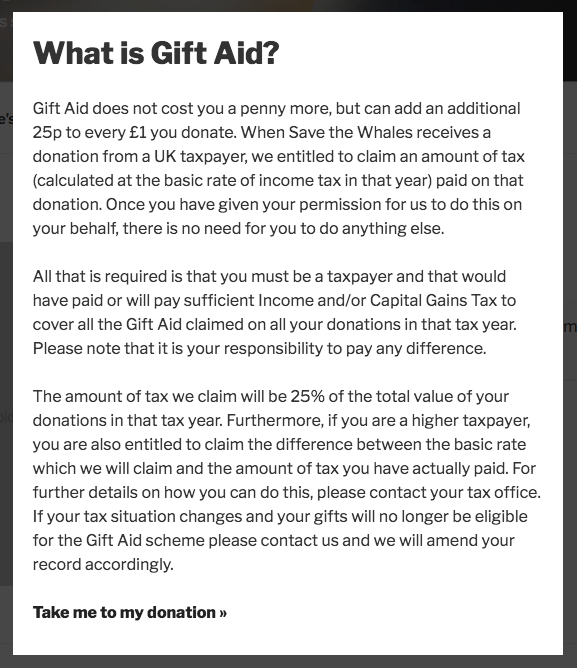 The Gift Aid bulk form export option.